SNAP!!! Geocaching: 2016 Winner of the "SUPER-COVETED" SNAP!!! Cache of the Year! 2016 Winner of the "SUPER-COVETED" SNAP!!! Cache of the Year! The 2016 Winner of the "SUPER-COVETED" SNAP!!! Cache of the Year Award!!! This year we are having a terrible time figuring out who the winner was. We have worked on the list and have the FINAL 14 figured out and have decided to sleep on the list for a few nights to make sure the winner is the right one! So, who is in the FINAL 14! Back in April we ran across this really interesting Multi-cache near Surry. GC6C9HP - Dead or Alive - hidden by kekj. A really well laid out cache that involved a little more than the average cache. Also in April, we ran into a cute little cache in Virginia Beach - GC68RXX - Swirly - hidden by steve-n-kim. Interesting and cute, very cute. We really like crafted caches so when we ran into - GC5ZJ9N - Old Virginia Beach KOA Marvel - hidden by KangaCacher and maintained by Episcodad it was a sure winner for the Cache of the Day Award. We were in Charlottesville in June and ran across a very scenic cache - GC15ENQ - All Seeing Cache - hidden by Team Quanderers and adopted by Helpercache. While on our trip to Canada in July, we found GC2GW5D - Benedict's Brother-In-Law - hidden by gamestermike89 - a historic cache! An interesting Virtual Cache we found, also on our way to Canada, was - GC7C06 - Witch's Leg - hidden by The Duo Plus ? The main target of our trip to Canada was - GCBBA - Geocache--Canada's 1st geocache - hidden by ken kane. While on our trip to Canada, we took a side trip to Prince Edward Island to locate Virtual Cache - GC7C82 - Elevation Zero - hidden by LaurieM and Dad. This is our Northern-most cache! Gadget cache: GC6MYT6 - Peace, Love and Gadget Caching! - hidden by Geo Cord Buddy. In late July, nan & I organized a group attack on: GC190EK - EVIL! - hidden by Frogmen83. If you are ever passing through Scott County Virginia on Rt 58 - make sure you stop at GC3EY94 - HWY 23S TB DEPOT ~ TRAVELING THE TRACKS WITH KENNY - hidden by Scott County Tourism. In August, Nana & I found this cache on our first try!!! GC2CKWN - GeoNana - hidden by Laura's Boys. Another hard to find cache makes the list with - GC6P4YV - Bamboozled III - hidden by AllstarSS. 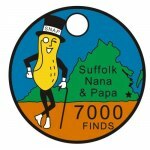 Nana & I will announce the winner soon!!! 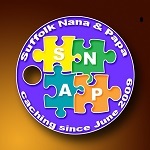 Labels: #geocaching, #gogeocaching, Cache of the Day, Coveted, Geocaching, Geocaching blog, SNAP, SNAP!! !